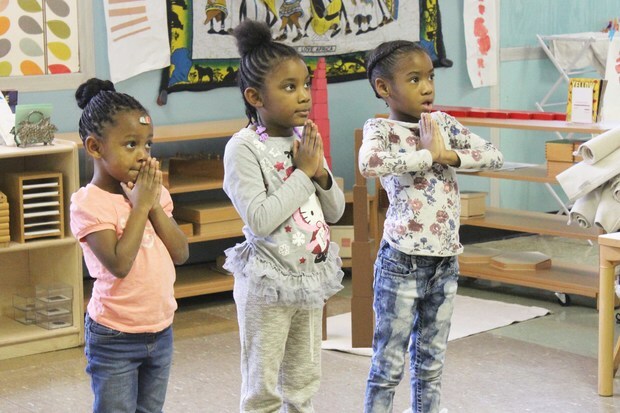 ENGLEWOOD — Students from the Montessori School of Englewood moved through yoga poses last week, pretending to be sharks, cobras and even trees. Volunteers with Englewood nonprofit I Grow Chicago meet with students twice a week at the school, 6550 S. Seeley Avenue. Volunteer certified yoga instructors visit different classrooms and conduct interactive yoga routines. While the activity is a fun break for the kids during their school day, instructors say it can also help them cope with the stresses they sometimes face. Students from the Montessori School of Englewood learn yoga from I Grow Chicago volunteer instructors Jan. 7, 2016. “We want a fun way to put together all the different poses,” said Sharma. At the school late last week, Sharma and Shango directed the children to get into a circle, where they began inhaling and exhaling. They did basic stretches like touching their toes and extending their arms towards the ceiling. After that, things got a little more fun. “What do you think about going on an adventure?” Sharma asked one group. The second graders shouted “Yes” in unison. “Okay, we’re going to the jungle,” Sharma said. The group pretended to walk and were asked to name what they see. Between giggles, the students shouted out different animals, such as “a snake” and “a monkey.” Sharma tells them to pretend they’re monkeys. They later act out the motions of a cobra, a tiger, an elephant and more. “It’s a good way of putting together the postures and teaching yoga in a way that’s engaging and fun for them,” Sharma said. Kianna Blumenbery, an 8-year-old third-grader, said yoga is “fun” and that she likes pretending to be a frog. Chasani Nkighten, 8, prefers being hunched over swinging her arms like an elephant would its trunk. Second-grader Grace Long, 8, likes to be challenged more so she likes the tree pose. It requires her to stand with arms stretched upward, palms together, all while on one leg. Even though the yoga session is fun, Sharma hopes that the students are learning skills to deal with outside stressors. Teaching them this coping method while they’re young is important, he said. He also teaches yoga at I Grow Chicago’s Peace House and said that youth from the community have come back to say how yoga has made a difference in their life. They’ve even taught their family and friends. The school’s principal, Paul Guilianelli, welcomes the partnership with the nonprofit. They’ve been coming to the school for the past three years, but this year it has become more consistent. “It’s really important that our students have the opportunity to learn techniques to deal with maybe some of the social emotional challenges they’ve encountered, or some of the things they encounter in the neighborhood,” he said. Guilianelli said that yoga can benefit people of all ages and from all socioeconomic backgrounds. For Englewood, he believes it can help the school’s students deal with the after-effects of gun violence. The school is exploring options of starting a potential afterschool program with I Grow Chicago. The organization is also in O’Toole Elementary, which is next door. Sharma said they are hoping to expand into more schools throughout Englewood.